Testing Exchange 2013 means careful planning of what you are going to test in lab, what you need to test al given scenarios and what is required. One of my golden rule is to test multiple versions of clients against given server. So in my recent configuration testing, I created a very simple lab. It has a domain controller, two Exchange 2013 servers, a load balancer and two client machines. All testing I am performing is on intranet and no internet simulation or remote client scenarios are going to be tested. One of my client machine is running Windows 7 and Outlook 2010. The other client runs Windows 8 and Outlook 2013. After I completed setup of my first Exchange 2013 server and load balacer, I decided to test the clients before diving into setting up second server and DAG. Clicking ok took me to next and somewhat familiar screen of profile setup, showing Exchange server and mailbox information. Not surprisingly, for exchange server, it shows guid@smtpdomain of user mailbox. This is new to Exchange 2013. 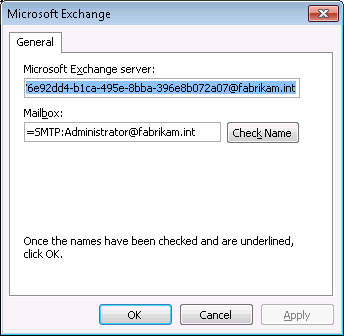 Exchange 2013 creates a connection point comprised of mailbox GUID @ primary smtp address in effort to nearly eliminate the familiar “Your administrator has made a change to your mailbox. Please restart.” message. Refer to “Exchange 2013 Architecture section of this TechNet article (http://technet.microsoft.com/en-us/library/jj150540(v=exchg.150).aspx) for more details. Now I have to figure out how to make this work since Outlook 2007 and above is supported client versions for Exchange 2013. Since I had second client machine with Outlook 2013 handy, I proceeded to first test the differences between the clients and see if that made any difference in the initial experience. If I were to tell you that it just worked without the error I was getting in Outlook 2010, will you be surprised? At this point, it was clear that the issue wasn’t my server or load balancer configuration. The issue was certainly local to Outlook 2010. So on to trustee Bing.com… and what did I find? Outlook 2010 update released on April 2012. While Microsoft knowledge base article KB2596959 referenced in the update doesn’t exactly map to the issue I was having, it caught my attention as it mentioned GUID@DOMAIN.COM. I immediately downloaded the update and applied it to Outlook 2010 client. Now, will you be surprised if I tell you that Outlook 2010 had no problem setting up profile correctly after I applied this update? I just tested this on my test Windows 7 machine with Outlook 2010 Std, no service packs or hotfixes. It connects fine to Exchange 2013 running on Windows 2012. My Outlook version is 14.0.4760.1000 (32-bit). What was your machine like? I also have CAS/MBX roles running on same server with L4 load balancer deployed. Certificate is issued by enterprise CA and is also deployed on LB. LB decrypts traffic and then re-encrypts it back to CAS server. It’s always advisable to update to the most recent version. It doesn’t take much time and ensures that you are working with the most up to date technology. I have setup Exchange 2013 MB,CA combined, and using a Windows 8 machine with Office 2013 tried to setup Outlook. However I am still getting – the connection to Microsoft Exchange is unavailable. 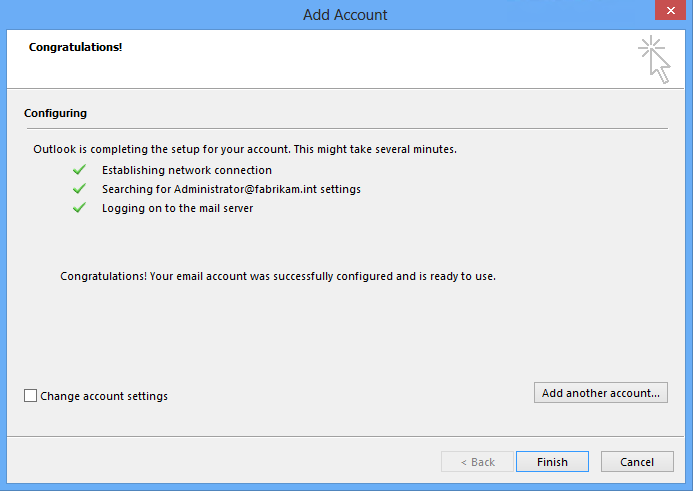 Outlook must be online or connected to complete this action – Error. Did you apply abovementioned update to Outlook? Hi, I have the same problem with Windows 8 and Outlook 2013. I thought the update is only for Outlook 2010? Btw. I am testing from external. The Mailbox Server is being resolved fine, so same Problem as in this article. What could be the Problem? My article only addresses specific situation. The error message may be exactly same but reason why it happens can be entirely different. Sorry don’t have answer for specific situation, you will have to investigate. I would start with ensuring basic configuration is correct (autodiscover, publishing through reverse proxy etc). and both worked for me(outlook 2010 and 2013) without issues. did these two clients have default gateway configured? (just bogus one like .254 ? I believe my external clients did not have default gateway configured. Internal clients did. Both internal and external clients had this issue so hard to imaging it was due to default gateway configuration. I am having this problem. I have applied the update and it said that this update has already been done. I have no idea why I cannot connect! It is difficult to troubleshoot without details. Please provide details such as version of client you are running, if they are internal or external clients, if you are using load balancer or not etc. I am unable to connect Outlook 2007 SP2 to Exchange 2013. I have tried all tricks…. Is it possible to advise correct setting/step by step to resolve the problem. Without knowing what you have tried to troubleshoot and what your current settings are, not working is a very broad symptom to have accurate response for. Sorry. PC clients running XP with outlook 2007 SP3 ask password everytime when connecting to exchange 2013. I am not having this problem with Clients running Windows 7. That sounds like incorrect outlookanywhere configuration. Is the client internal or external? Is public certificate in use? we are trying to connect outlook 2013 32-bit & 64-bit clients pro plus clients to exchange online, but to no avail..
we are facing error of encrypted/non-encrypted connection while trying so..
we have run office 2013 sp1 and some known fixes. Ajit, sorry I am unable to provide resolution. What I wrote is about a specific issue but OUtlook 2013 exhibiting the behavior could be entirely different issue. In your case it seems to be server configuration, although it is difficult to say it with confidence without knowing your environment. I have Exchange 2013 with SP1 installed in my environment. I am trying to configure outlook profile in outlook 2013 i am getting ” The connection to the Microsoft Exchange is unavailable” error. I tried all the Google provided solutions still unable to configure the outlook profile. I am able access the same mail box through owa. Seems like your configuration may not be proper/adequate. Ensure autodiscover is responding and is returning correct information. Also check urls returned by autodiscover are accessible. Hi Bhargav! I am using Exchange Server 2010 for Multi-Tenant environment. For my tenant when I configure Outlook 2010 running on Windows 7 over Internet I am getting the following error: The connection to the Microsoft Exchange is unavailable. Outlook must be online or connected to complete this action. I have already applied the right proxy settings in Outlook 2010 to work but still i am getting the error. OWA and ActiveSync works fine. I would recommend going to http://www.exrca.com and running relevant tests. That should help you determine root cause if it is a server configuration issue, which is what is sounds like from your comment.